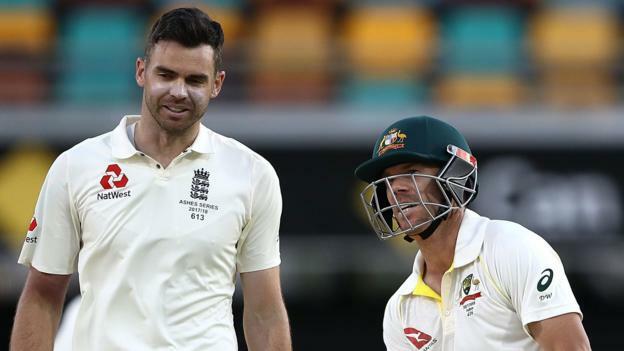 Australia’s cricketers have “tried too hard to be aggressive” in the past few years, says England bowler James Anderson. A draw with Pakistan was Australia’s first Test since the ball-tampering scandal that saw Steve Smith, David Warner and Cameron Bancroft banned. Before the 2017-18 Ashes, Nathan Lyon said he hoped his side could “end the careers” of some England players. “They thought that this is how Australians play,” said Anderson. Anderson, 35, told The Cricket Social the England squad thought off-spinner Lyon’s comments were “out of character” and that they knew “a lot of the Australia team were not like that”. England will try to regain the Ashes when they host Australia in August and September 2019, having lost the most recent series 4-0. Tim Paine, Smith’s successor as captain, said Australia will play “hard but fair” in the two-Test series against Pakistan in the UAE, while the wicketkeeper has introduced pre-match handshakes with the opposition. “Tim Paine is a genuinely nice guy, Mitchell Starc is not naturally aggressive despite being a fast bowler and even Steve Smith is a really good bloke – there is no real malice with anything he does – so it was really out of character,” said Anderson. Smith and former vice-captain Warner were sacked and banned for a year, while batsman Bancroft was suspended for nine months, for a plan to use sandpaper to damage the ball during the third Test of a fractious series in South Africa in March. Darren Lehmann subsequently resigned as head coach in May to be replaced by fellow former Australia batsman Justin Langer. During last winter’s Ashes, Anderson said Australia would “do anything it takes to get under our skin” because it is the “biggest thing” for a cricketer to be involved in. On the field in the first Test, Warner referenced wicketkeeper Jonny Bairstow ‘headbutting’ Bancroft on a night out before the series. “I’m not sure Bancroft wanted that to come out in the papers but, because it is the Ashes, they thought it was win at all costs,” said Anderson. Anderson, who surpassed Glenn McGrath in September for the most Test wickets taken by a seam bowler, acknowledged he had “certainly not made any friends” on the field with his style of play at times. But he added “you have to look” at how the captain and coach want the team to play. “When Brendon McCullum was New Zealand captain, he made it all about being entertaining and showing off your skills,” he said. The Cricket Social will return on the BBC Sport website and app for the third ODI on Wednesday.